Bovee and Kirkpatrick eat at the table he designed. The cooktop, oven, and dishwasher are by Bosch; Bren Reis of Earthbound industries made the cabinets. Three years ago, they were living a few blocks away in a similarly sized rental in a subdivided Portland four-square. “We didn’t feel like we needed more space; we just wanted it to work better,” says Kirkpatrick of the dark series of closed-off rooms that comprised their apartment. With plenty of design acumen between them—Kirkpatrick is a designer with his own firm, Design for Occupancy, and Bovee is a studio director at branding and marketing company Joule—they decided to build their own house and started scouting the nearby streets for an empty lot. They found themselves coveting a particular 50-by-50-foot corner space. Perfectly positioned in the inner Southeast Portland neighborhood they’d come to love for its easy combination of residential feel within an urban setting, the land is a manageable walk to downtown, and amidst a heady hipster mix of restaurants and shops. The lot itself, bounded by a chain-link fence and occupied by a lone hydrangea bush, was an unloved, unused side yard for the house next door—in other words, a blank slate. The couple put in an offer, and they became the proud owners of their own patch of turf. Nine months later, after an uneventful construction process, Bovee and Kirkpatrick moved into their dream home. 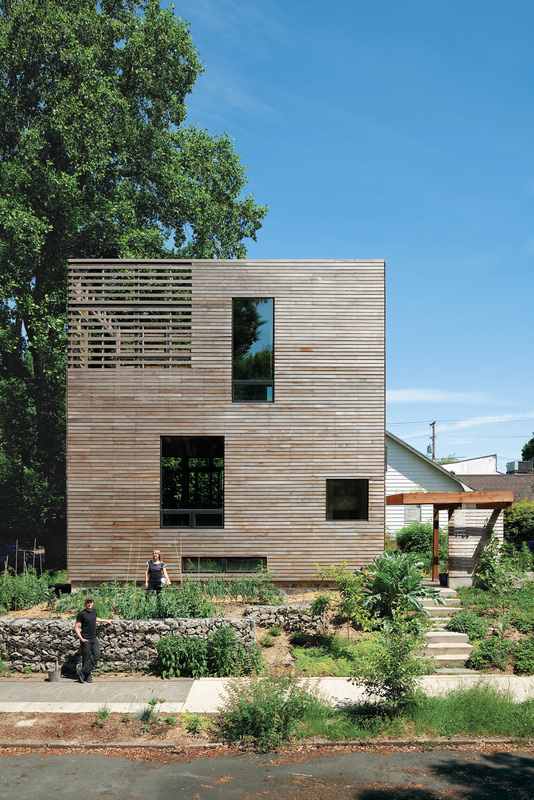 Kirkpatrick designed the house to draw upon the outdoor area rather than dominate it. Instead of a single-story home that spreads to the limit of the lot, the three-story house holds itself trimly in place. A basic box that’s as tall as it is wide (28 feet) and 16 feet long, the house consists of rooms stacked verti­cally: an unfinished basement on the bottom, a kitchen-living area and a bathroom in the middle, and a bedroom on top, with the stairwell hinged onto the front of the home. The only interior doors are those to the bathroom, basement, and root cellar, leaving the rest of the space open and unfettered. 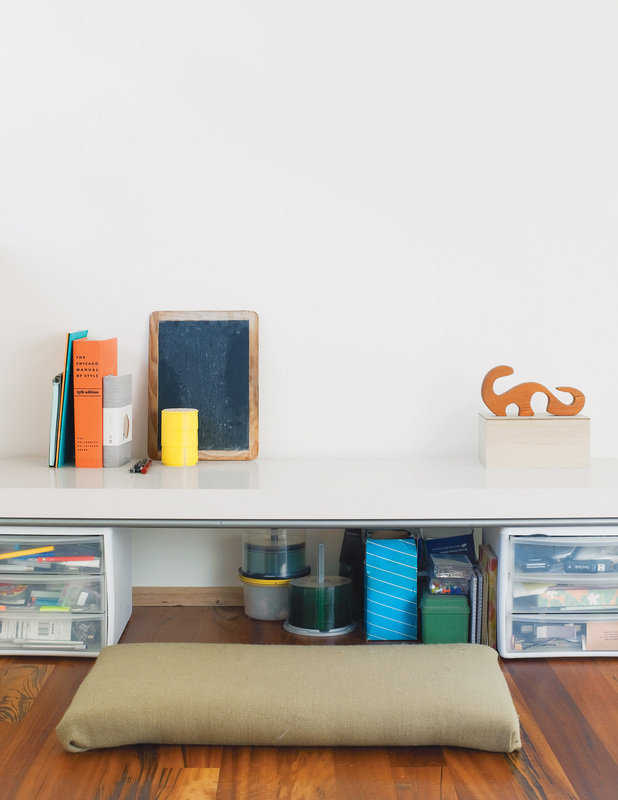 All the furnishings are pared down to basic func­tions, and many serve dual purposes. A horizontal bank of cabinets set against one wall, with integrated appliances and sleek stainless countertops sliding on top, makes up the kitchen. The dining, coffee, and side tables, built out of leftover cabinet scraps, double as Kirkpatrick’s work spaces. Upstairs, the closet is a rod tucked under the sleeping loft, where Bovee writes freelance art reviews on a desk at the foot of the bed. 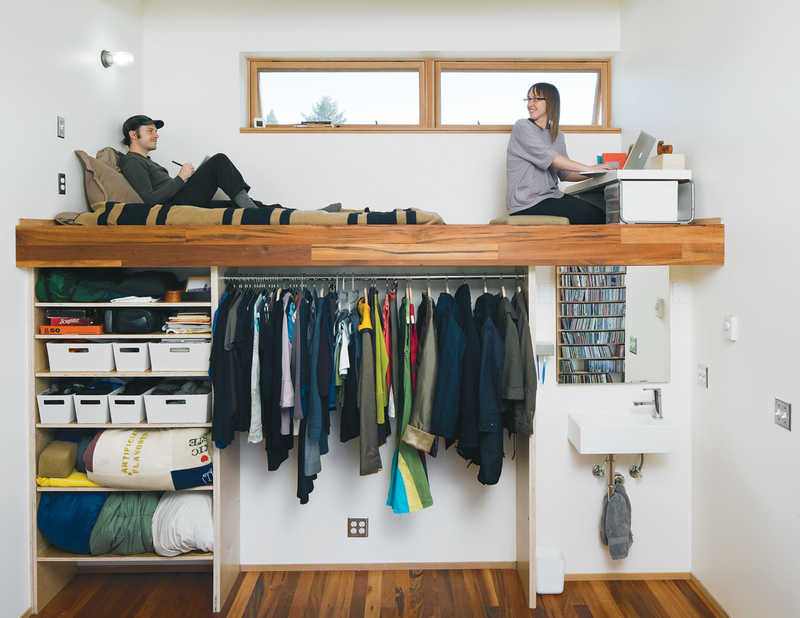 Indeed, there are many benefits to living com­pactly beyond having less space to maintain. The couple was able to use earth-friendly materials to create a well-crafted home that came in on budget for a total of $230,000 (minus the cost of the land); if they had added square footage, they wouldn’t have been able to afford the same quality of materials. The framing, for example, was done with structurally insulated panels, rigid building sheets that are incredibly energy-efficient and structurally sound. Add to that triple-paned windows, FSC-certified hardwood floors, and a water heater that draws heat out of the air in the basement to warm up the house’s water, and the house is a model in small-scale sustainability. Yet perhaps what makes the home feel expan­sive is its interaction with the outdoors. “The neighbor­hood is part of our lifestyle,” explains Kirkpatrick. The windows frame views ranging from their neigh­bor’s gnarled tulip tree all the way to the down­­town skyline. When the weather allows, the couple pulls their dining table onto a deck off the living room, and on balmy evenings they can even sleep out on the green roof, which is accessible by a sliding door in their bedroom. Another planted roof caps the house and provides the perfect perch from which to watch Fourth of July fireworks. A 10-by-30-foot garden space out front has become a veritable farm where they grow everything from blueberry bushes to persimmon trees to fava beans. If they yearn for a grassy lawn to lie on, there’s a huge field behind a school a block away. 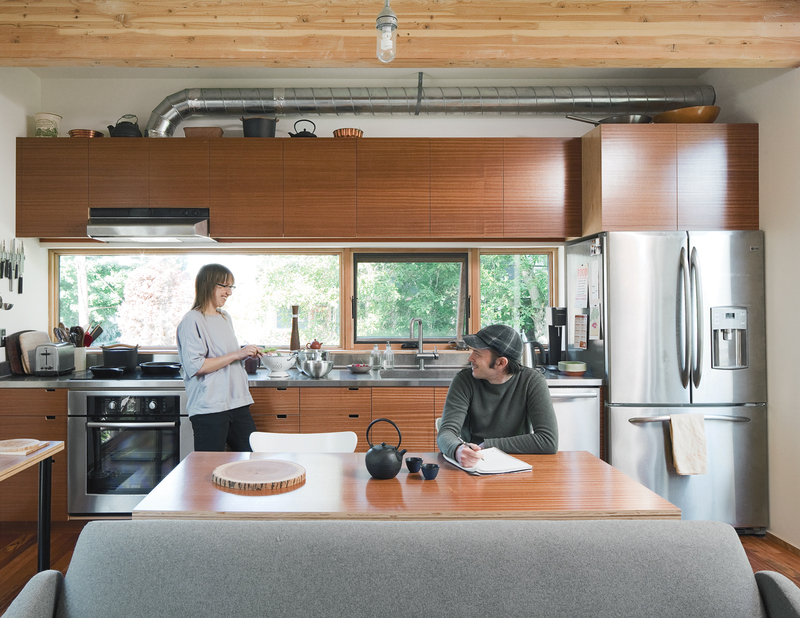 Though Matt Kirkpatrick and Katherine Bovee didn't crave a mansion, they did design a handful of clever spatial tricks to keep their small home just the right size. Most people ignore their park strip, letting weeds take over. Kirkpatrick and Bovee turned theirs into a wild­flower meadow, with around 30 vari­eties of native plant species. From lupine to meadow foam to larkspur, the greenery attracts insects and birds—–and extends their living space all the way out to the street instead of stopping short at the sidewalk. Stairs are often space hogs. To make the most of space that would other­-wise be wasted, Kirkpatrick used the intersection of stair levels to their advan­tage: At the front door, where the stairs descend to the basement, he created space for a coat rack and front entry area, and on the top level, he placed the sleeping loft on a platform above the stairs. With an eye to making everything dual purpose, the couple created a foot-thick wall that separates the bathroom from the living area. On the living-room side, it’s a bookshelf with space for cooking tomes and the pair’s antique camera collection. On the bathroom side, it opens up into a storage area for towels, toiletries, and other personal sundries. For floor plans of the Harpoon House, please view the slideshow.